Full planning approval gained and due for completion on site by mid 2019. 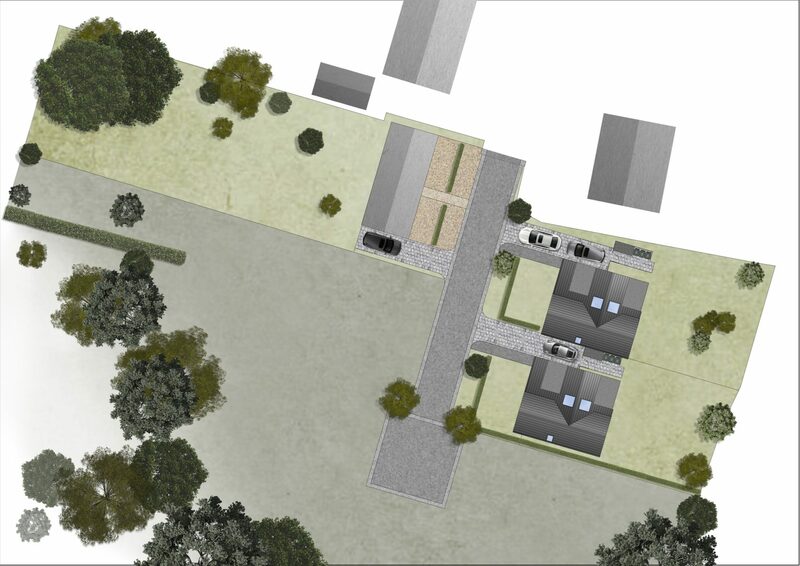 A first-time developer approached Hive to develop a plot with two bespoke houses they’d had outline approval for. 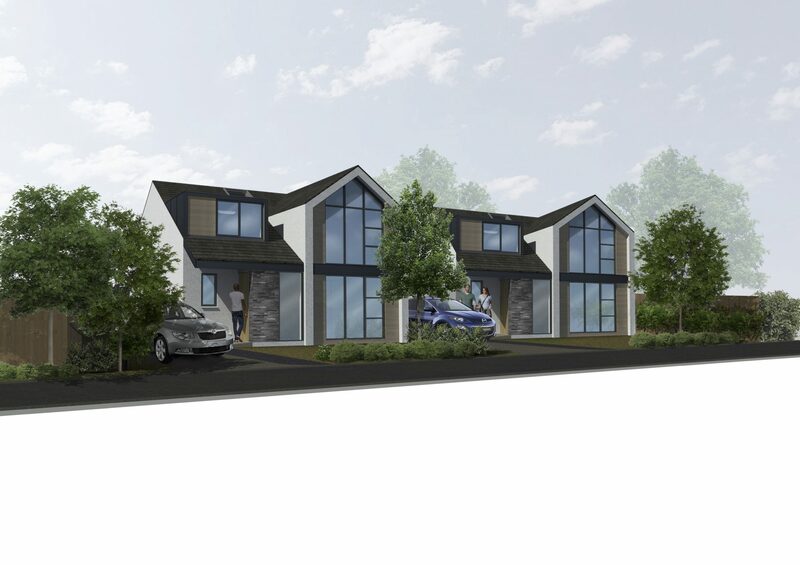 Our brief was to develop the outline approval into a high efficiency but stylish development that would maximise returns, while also providing high quality contemporary houses. The outline approval set down various constraints on volume and scale. Our first move was to change the layout, moving away from mirrored houses to identical units adjacent each other. This allowed the driveway to create the detachment between the dwellings, rather than a wasted alley. It also simultaneously allowed wider dwellings, which in turn could be shallower on plan. This would improve daylight penetration and natural ventilation, and increase the amount of rear garden space. Roof space accommodation to the first floor was essential due to height constraints, but we were able to turn this into a design feature, with lofty vaulted ceilings and glazed gables to front and rear. Roofs were orientated to allow less impact on an adjacent bungalow, while also providing south facing roof areas for solar heat or power. By meticulous layout planning to minimise circulation space, we managed to increase the number of bedrooms to four well-sized rooms rather than three, provide an en-suite to the master, and add a small utility room at ground floor. The design is exceptionally efficient without sacrificing architectural and spatial quality. Our use of economical materials in certain places, such as render, allowed us to use high specification materials on key features elsewhere, such as zinc, without exceeding the budget. "Rob McGinnes of Hive Architects Studio came highly recommended to myself by a good friend and has been an invaluable asset to our development, working together on an amazing design that has far exceeded our expectations. Rob and his team have gone out of their way to look after us and it has been a pleasure working together and we are already looking forward to our next project with Rob and Hive Architects Studio." Full planning approved with increase in bedroom numbers and dwelling volume over outline scheme. Initial budget costings indicate a very reasonable build cost which, with likely sale values, will exceed yield requirement. 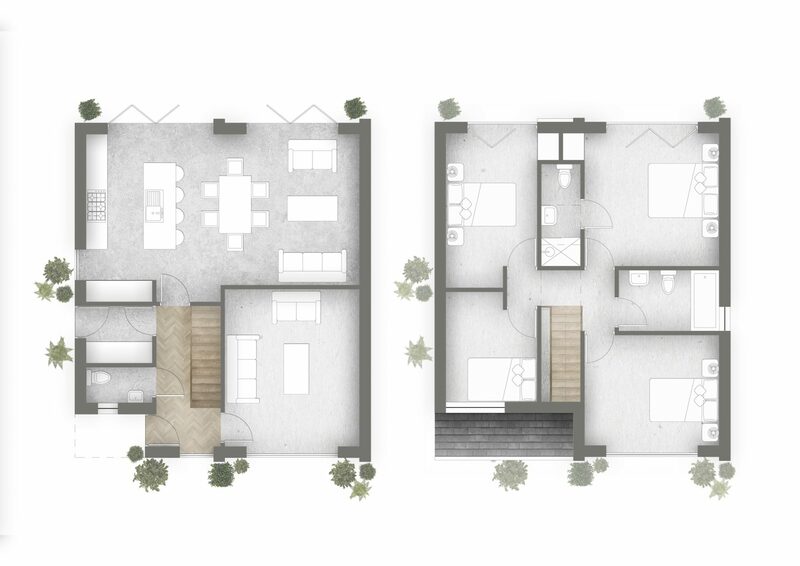 The client expects to occupy one of the homes himself.